As a real estate professional, you may come across mortgage fraud at some point during your career. Mortgage fraud can be defined as fraud related to property mortgages or equities. Typically, this involves a “mortgage fraud for housing” situation, where buyers misrepresent or purposely omit information in their loan application to secure a larger mortgage than they’d ordinarily be entitled to. But other forms of mortgage fraud can occur. The vast majority of mortgage fraud cases relate to income fraud. From falsified documents claiming higher incomes to undisclosed loans and liabilities, mortgage fraud is motivated by a desire to convince lenders to loan more funds. Some fraudsters will even falsify a new employer, complete with payslips and phone verifications. “New employers” tend to be falsified because it makes it impossible to verify income actually earned through IRS records. According to Core Logic, income fraud increased by 22.1% between 2017 and 2018, and it’s predicted to continue increasing. With home prices on the increase and demand outweighing supply, home buyers are pulling out all the stops to qualify for bank loans. Another form of mortgage fraud is “occupancy fraud”. This form of fraud occurs when buyers lie about their intended use of the property they’re purchasing — to obtain access to special programs or pricing. For example, buyers may tell their bank they’re purchasing the property as an investment, but use it as a primary residence, or vice versa. Lastly, transaction fraud is another type of mortgage fraud. This can occur when buyers are fraudulent in the transaction process, either by falsifying deposits or misdirecting funds. Learn more about wire transfer fraud. Where is it Happening and What’s the Impact? Mortgage fraud is happening across the country, with an estimated one in every 109 mortgage applications having indications of fraud. According to a Core Logic Mortgage Fraud Report (released in September 2018), New York, New Jersey, and Florida are the top three states for mortgage application fraud risk, rankings they have held consistently over the past year. The locations with the highest annual increase in risk include Illinois, Mississippi, New Mexico, Texas, and Oklahoma. The rising rate of mortgage fraud cases in the United States has resulted in many homeowners with mortgages much higher than the real value of their homes. Increased rates of foreclosures and loan defaults are other side effects. When providing advice to potential buyers, avoid any recommendations to enhance ‘the facts’ to meet mortgage criteria. Avoid being caught up in any “mortgage fraud for profit” situations. “Mortgage fraud for profit” often involves professionals within the industry, such as bankers, brokers, lawyers or other industry insiders, who facilitate fraud for monetary gain. There are tough penalties for mortgage fraud, including significant fines and even imprisonment. So what can you do to spot the signs of mortgage fraud in your real estate or mortgage brokering business? You may come across situations where you’re asked to interfere with appraisals, change purchase agreements or contracts, or be part of the verifications process. Agents can even inadvertently get caught up in a fraudulent scheme through simply passing on information between parties. These are all red flags. Attention to detail, especially in the preparation of sales agreements is essential to ensure your accuracy. For example, the property address must be correct, signatures must be legible, and if there are any blank pages or information which appears inconsistent, this could be a red flag. For mortgage brokers, people with a limited credit history or those who are hiding the source of their down payment can be a red flag. Inflated incomes for particular occupations, or unverifiable new jobs with large incomes, can also be a sign that something is remiss. For more information, check out the National Association of REALTORS© guide to recognizing mortgage fraud. Real estate agents and brokers need to be very aware of the line between legal and illegal activity. Not every case you’re suspicious of will actually turn out to be mortgage fraud. But taking the time to consider the validity of all transactions you’re a part of is time well spent in protecting yourself and your business. 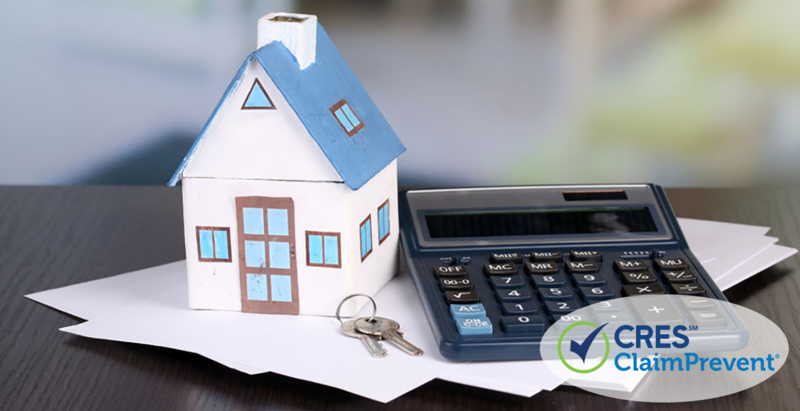 To protect yourself against mortgage fraud accusations, or even worse, lawsuits, ensure you have sufficient insurance coverage. With CRES Errors & Omissions (E&O) Insurance + ClaimPrevent®, you can stress less. With a customized policy to suit the specifics of your business, you can be covered for the risks you face every day in real estate, property management, appraisals, and mortgage brokerage. To obtain a quote, contact the CRES team on 858.618.1648.